Web.com provides great do-it-for-me (DIFM) options, with no setup fee and no long-term commitment, and can build your website for you, saving you time and stress. While it does'n offer a free trial period, and the free website builder option comes with serious strings attached, there are more than 2,500 different designs in Web.com template gallery, giving you a variety of options to choose from. There are a number of Web.com pros and cons to consider when comparing this website builder against the many other popular options on the market today. While there are areas where Web.com benefits its users more than some other builders, for the most part, the offerings fall far short of the best builders, which are more elegant, intuitive, and user-friendly. When you’re deciding how to create your site, you can do it yourself with the Web.com website builder, or pay the Web.com company to do it for you. On Web.com, there’s a clear emphasis on the custom-built sites from their experts. If you choose to go with Web.com, this is the service we recommend and is the company’s strongest offering. On the other hand, you can create your own site on Web.com with its DIY Web builder. It isn’t the most intuitive tool I’ve ever used, but it’s still possible to make attractive and functional websites with it. Check out some Web.com examples in the Website Gallery. In short, the DIFM service is robust and will allow you to get exactly the site you want, without having to do much on your end. But most reviews of Web.com agree that the Web.com DIY process takes more time, effort, and patience than many other modern builders require. Good candidates for the Web.com builder are small-business owners and individuals who seek a simple, no-frills website they can create and maintain themselves. In particular, the “We Build It For You” option from Web.com is a great choice for any person or business that doesn’t have the time, energy, or interest in designing their website themselves. The number of Web.com website templates I was able to choose from was overwhelming. There are over 2,500 different Web.com design templates to browse through, but many of them are just subtle variations of the same few structures. In the Web.com template gallery, the Web.com templates are organized into roughly 30 different categories. Each category contains at least a few subcategories and by clicking on any of the Web.com template examples, I was able to see a slightly enlarged view that offered a bit more detail. In addition to choosing a template by browsing through the categories, users can also search by keywords or by color scheme. After finding a theme you like, though, there’s no option to play around with a demo to see how the example sites worked. One neat feature of Web.com’s builder is that it allows you to easily switch between site templates. If you’re interested in a different look for your site, you can just pick a new theme, and the Web.com builder will migrates all of your information over, so you don’t need to recreate your site from scratch. Although Web.com software does have a cleaner interface than a few builders I’ve used in the past, the software is plagued by frustrating bugs that prevented me from making much progress with my site. The majority of Web.com reviews also express at least some level of frustration with the platform’s usability. Unfortunately, the Web.com user experience leaves a lot to be desired when it comes to ease of use. Since there’s no option for a free Web.com demo, there was no way for me to test drive the platform’s interface without first signing up for a paid account. It was only after signing up that I found four Web.com tutorial videos that demonstrated the builder in action. But with a combined length of less than 10 minutes, the Web.com tutorials were far from comprehensive. Web.com pricing for the DIY builder actually starts out affordable and competitive, but then skyrockets to ridiculous rates after 30 days. For example, the introductory Web.com cost for using the website builder starts at just $1.95. But four weeks later, the rate jumps to $22.95 per month. That’s much higher than what more modern and feature-rich Web builders charge for similar plans and better software. This could explain all of the Web.com reviews with complaints. Individuals, organizations, and small businesses can get great custom-built sites at no upfront cost. This includes professional design and copy written just for you, along with a few other features. Business – Web.com will work for virtually any type of business, from restaurants to retail stores, whether or not they’re interested in Ecommerce. When Web.com builds a site for you, they can make sure it’s listed in search engines, and you’ll have the tools to track your site’s stats. Plus, you can upgrade to a mobile-friendly site, so users can view your site on any screen size. Portfolio – Artists, musicians, and designers can build a portfolio website to showcase their best work. This is an audience that will really appreciate the 2,500 website templates offered. Blog – Bloggers can use Web.com’s website builder to create a personalized place to share their thoughts. The tools to create content, insert images, publish, and promote are all offered by Web.com. Though I didn’t take advantage of this feature, Web.com offers a helping hand for those getting their first site off the ground. The company’s certified Website Coaches are committed to helping customers create better websites without it costing them an arm and a leg. These tech-savvy tutors promise to do everything in their power to ensure that visitors have an enjoyable experience on your website. For starters, a Web.com Website Coach will give you a guided tour of the builder’s interface and provide you with some sound advice for selecting the best template. After that, your Coach will walk you through the process of choosing appropriate images for your site, and give you tips for editing them. Finally, prior to publishing your site, a Web.com Website Coach will review your design and content decisions, and evaluate your site’s optimization for search engines. And even after your site is live, your coach can continue to provide additional recommendations that will help your site perform well. Mobile responsiveness isn’t exactly one of the builder’s strong suits. As opposed to more advanced platforms, Web.com mobile websites aren’t dynamically resized versions of existing sites, optimized for smaller screens. Instead, they are completely separate sites that require their own maintenance, and that come with their own price tag. Mobile Web.com websites are also built using a different set of tools than their desktop counterparts. Meaning that if I want to update my site, I need to do it in two places with two different tools. That’s not exactly ideal. And after a one-month free trial, the Web.com mobile service costs an extra $5.95 every month. Many other modern builders include mobile responsiveness at no additional cost. Web.com has special offerings for small businesses looking to sell products online. They have DIY plans, as well as DIFM options for Ecommerce. Setting up a Web.com Ecommerce store wasn’t too tough. Upon signing up for Web.com Ecommerce, a software wizard popped up to point me in the right direction. Then it was time to choose one of the Web.com Ecommerce templates for my store. After that, I was uploading product images and descriptions. Web.com stores allow users to accept payments from every major credit card company, plus other services, including PayPal. The platform also gave me the option to choose a payment processor in case I didn’t already have one. Web.com’s Ecommerce solutions are surprisingly robust. Aside from adding products and managing orders, you can keep track of your customers and send them marketing messages. Web.com also provides users with comprehensive reports, and makes it easy to search for customers, orders, and products. There are a number of other available features, including the ability to create coupon codes, customer blacklists, and tracking codes for online advertisements. Web.com offers three Ecommerce packages; the Ecommerce Express Package, the Ecommerce Standard Package, and the Ecommerce Pro Package. The Express Package, starting at $29.95 a month, allows you to sell up to 20 products, includes an online store builder, multiple business email addresses and a 2.5% transaction fee. The Standard Package is significantly more expensive, $59.95 a month, but is a much better solution for those seeking a serious online store. It includes everything you get in the Express Package, but allows you to sell up to 500 products, gives you access to email marketing tools, submits products to Google for you and takes your transaction fee down to 1.5%. For those who have more than 500 products to list, there is the Pro Package, which allows for unlimited product listings, drops the transaction fee to 1%, includes a dedicated SSL Security Certificate and provides advanced marketing features, such as affiliate management. The Standard Package is Web.com’s most popular package, however, online stores that need the support of the Pro Package will pay $99.95 per month. 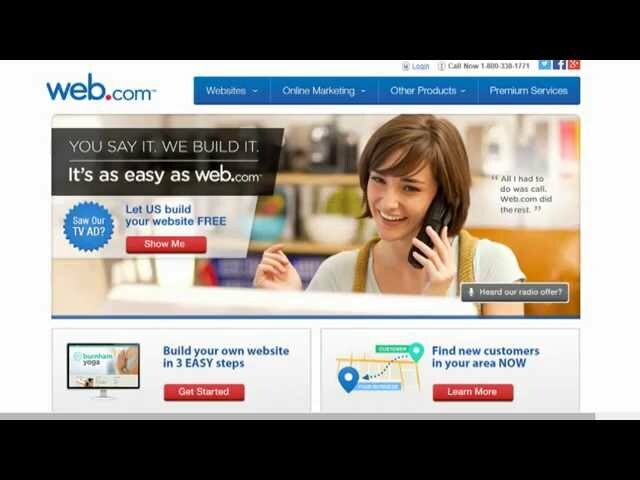 Web.com offers its Do-It-For-Me website building option for those wishing to build an online store as well. It also has small business specialists that study your business and work one-on-one with you in designing your online store, and will design a customized shopping cart for your store. What Web.com offers is not merely Do-It-For-Me design, but rather, a complete DIFM Ecommerce solution. Web'com's team works with online store owners over time to continually provide them with inventory tracking and management, credit card processing, automatic shipping rates, analytics and reporting, marketing on search engines and social media channels, as well as securing customers' personal details and payment information. Store owners can call Web.com's representatives to make monthly changes to their sites. Web.com will build your website for free, however you must sign up for an ongoing plan, which will vary in price depending on your needs. This option is much more expensive than Web.com's Do-It-Yourself options, however, it is a good solution for those who want their entire web operation taken care of by professionals. There is no set pricing for the Do-It-For-Me Ecommerce plans, as everything is customized. The most basic Do-It-For-Me plans start at $114.95 a month, however, expect to pay more for Ecommerce functionality. The customer service offered makes the price well worth it, and the cost is still just a drop in the bucket for a serious Ecommerce operation selling a high volume of goods. If you’re Web.com customer, you do get support. Users can contact Web.com customer service in a few different ways. For technical support with the email, hosting, or the site builder, call Web.com help at 1-800-932-4678. Customer support for Web.com’s SEO, Web design, and marketing plans can be reach by dialing 1-800-311-2707. Web.com customer support also gives you the option to call 1-800-862-8658 for a free consultation regarding the quality of your website. Alternatively, you can email customersupport@web.com for help, or search the Web.com customer support portal for the answers you seek. Is Web.com free? While the company doesn’t offer a Web.com free trial, there is a way to get a free Web.com website—with some serious strings attached. New users have the ability to get a site custom built from the Web.com experts, which can be costly but is less hassle, or take advantage of the Web.com free website design. With the free option, the catch is that you have to pay the company to host and maintain your site once it’s launched. And Web.com’s rates are a lot higher than even some of the best builders around. So is Web.com really free? Not even close. Web.com continues to attract customers, despite not offering the most competitive tools or plans. For five consecutive years, professional-services firm Deloitte has given Web.com recognition as one of the fastest growing companies in North America. Aside from that, though, there isn’t much positive Web.com industry feedback, and most reviews of Web.com are less than glowing. There are three primary Web.com hosting plans to choose from: Essential, Professional, and Premium. Essential hosting on Web.com includes 300 gigabytes of storage and allows for 100 multi-user email addresses, while the professional package offers 500 gigabytes and the same number of email addresses. The premium Web.com hosting services lets users store an unlimited amount of data, and have up to 1,000 email addresses on their account. The costs of these services are reasonable, but some of Web.com’s big-name competitors offer more robust hosting plans at lower costs. I was surprised by appearance of the Web.com mail experience from the moment I logged in. The interface has a very clean and modern look that contrasts sharply with the rest of Web.com’s interface. In fact, Web.com email looks almost as good as any other email client I’ve used. It was confused at first about how to actually check my email, though. I thought I’d be able to log in via the Web.com ProMail page, but that redirected me to the standard webmail.web.com login, which for some reason didn’t work. I was finally able to log into Web.com webmail right from my website’s dashboard, so I just bookmarked that page. Overall, the email feature looks good, but is not very intuitive. Web.com SEO comes in a few different offerings. The company provides full-service SEO support for individuals and businesses of any size. These plans start at $300 per month and include both on-site and off-site optimization. You also get to speak with a dedicated SEO expert on a monthly basis. If, like me, you prefer a more hands-on approach, SEO from Web.com also comes in the form of education. You can sign up for any number of training Web.com programs that will help you learn about analytics, link building, and getting found online. The DIY version of the Web.com builder can be used to create a decent-looking site to suit your needs, but has many limitations. We’d recommend the DIFM service instead to ensure you’ll get the best Web.com features and functionality. So, as for my Web.com website builder review, I’d suggest going with the custom-built site by the experts if you choose this provider!